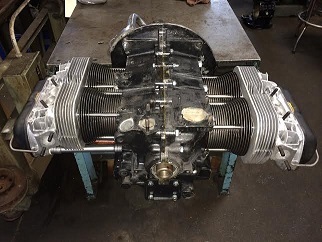 VW�Aircooled 1641cc Premium Longblock with Rebuilt German Dual Port Cylinder Heads. The longblock consists of the basic bottom end of a VW�Aircooled motor. It consists of a VW�block, piston & cylinders, cylinder heads along with a flywheel and oil pump and everything in between. This is considered the more technical part of the motor and it is tougher to machine and assemble for the at home "Do It Yourself-ers". So we take care of the bottom end and you take care of the top end. You will responsible for swapping your sheetmetal, intake, exhaust, carb, distributor, coil, wires on to this bottom end that we provide you. Buy with Confidence!�We have been building VW�Aircooled motors since 1970.